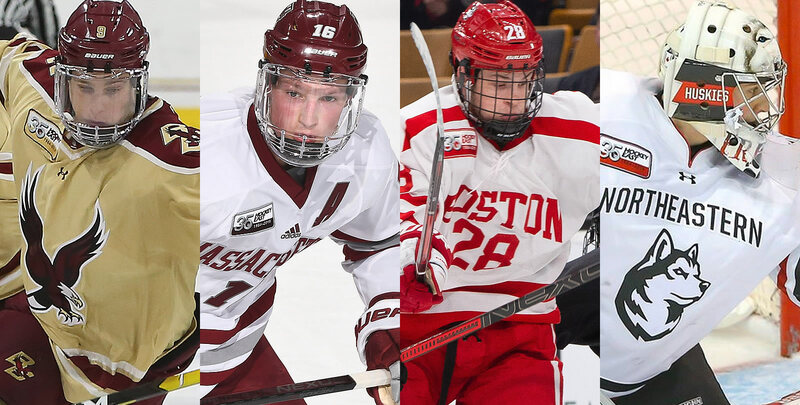 The 2019 Hockey East Tournament semifinals will feature a first-ever set of pairings and the one seed (Massachusetts), three seed (Northeastern), five seed (Boston University), and seven seed (Boston College) have advanced to the TD Garden for the first time in league history. The semifinal double header will begin Friday with No. 3 Northeastern and No. 5 Boston University facing off at 4pm, while No. 1 Massachusetts and No. 7 Boston College take the ice at 7:30pm. The winners will move on to the championship game on Saturday at 7pm. Both semifinals and the championship game will be shown live on NESNplus and streamed online at FloHockey.TV outside of New England. No. 7 Boston College (13-21-3, 10-11-3 HEA) moved past Providence (4-5 OT, 4-3 OT, 2-1) in a three-game road set as the Eagles become just the third seven-seed to move onto the semifinals (Vermont, 2015; Providence 2012) as the Eagles come into the semifinals for the fourth straight year. 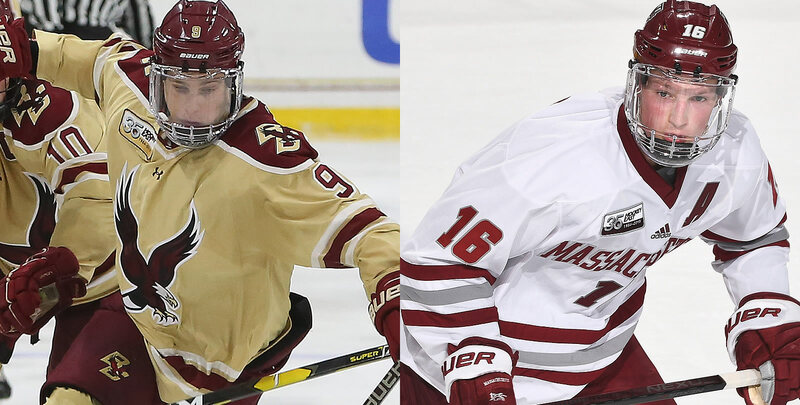 Boston College is making its 25th trip to the final four in the Hockey East Tournament, the most of any school and matched only by Boston University. All-time in the Hockey East Tournament, Boston College owns a 8-1 mark against Massachusetts including four quarterfinal round sweeps. The teams have never met in the semifinals. Jerry York is just one win away from 600 in his tenure at Boston College. No. 3 Northeastern (25-10-1, 15-8-1 HEA) meets No. 5 Boston University (16-17-4, 12-9-3 HEA) in the semifinals for just the second time in the programs' histories (1994.) The Terriers toppled UMass Lowell (2-0, 4-6, 4-1) at the Tsongas Center in a three-game set, marking the first time the Terriers have won a quarterfinal road series since 2004, while Northeastern took down the sixth-seed Maine Black Bears (2-1 OT, 2-1) on home ice. In 12 prior meetings in the Hockey East Tournament, Boston University owns an 8-4 record against Northeastern, most recently sweeping the Huskies in the 2017 quarterfinals. 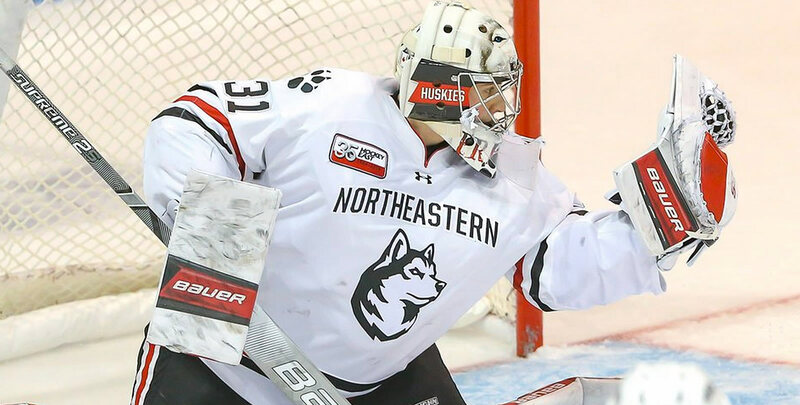 Northeastern carries a 2-8 mark in 10 trips to the semis, winning the Lamoriello Trophy in both years in which the Huskies advanced to the final (2016, 1989.) All-time, Boston University carries a 12-12 mark in the semifinals, and a 9-3 record in the title game. Last season, BU won its ninth tournament crown in program history, shutting out Providence, 2-0, in the championship match. Logan Hutsko (Tampa, Fla.) scored the game-winning goals in both Game 2 and Game 3 of the Hockey East Quarterfinals at #7 Providence. The sophomore forward clinched a must-win Game 2 just 23 seconds into overtime on Saturday to complete at threepoint night (1g, 2a) and secured the Eagles' 25th trip to the semifinals on a marker with just eight minutes left in regulation. Cale Makar (Calgary, Alta.) had a four-point weekend, which included scoring in both games and adding two assists in the series-clinching Game 2. Makar forced overtime in Game 1 by scoring the tying goal in the third period to complete a comeback from a 3-0 second-period deficit. The Hobey Baker candidate then had three points in Saturday's 6-0 shutout of the Wildcats on a goal and two assists, which included a power-play goal. He also entered the top-10 all-time for UMass in a single-season for points, currently tied for ninth with 46. 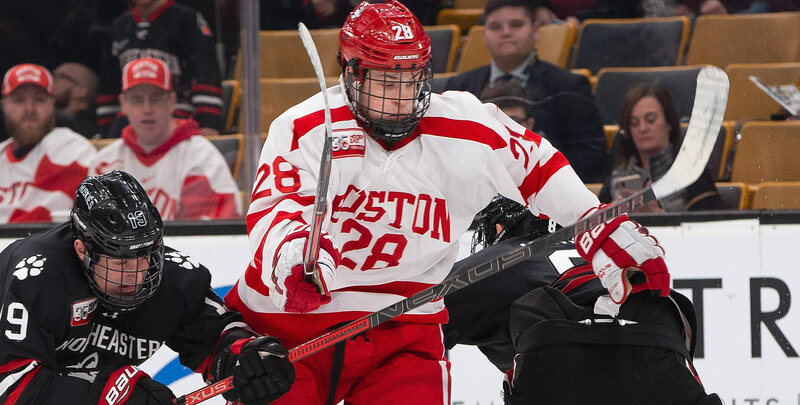 Joel Farabee (Fr., F; Cicero, N.Y.) potted four goals and added an assist in the Terriers' road series win at #4 UMass Lowell in the Hockey East Quarterfinals. He scored both game-winning strikes for Boston University, helping the Terriers win a quarterfinal road series for the first time since 2004 and advance to the semifinals for a league-record 25th time. Michael Kim, BC (Sr., D; Toronto, Ont.) Racked up five points on two goals and three assists in the three-game set of the Hockey East Quarterfinals at #7 Providence. He had a tally and a helper in Game 1, assisted on the game-winning goal in overtime of Game 2, and then scored again in the decisive Game 3, a 2-1 Eagles victory. Chad Krys, BU (Jr., D; Ridgefield, Conn.) Recorded back-to-back two-point games, picking up a goal and three assists en route to helping the Terriers move into the Hockey East Tournament semifinals for the 25th time in program history, the most of any league program. He also helped anchor a defense that allowed just 19 shots on net in a decisive Game 3. Patrick Harper, BU (Jr., F; New Canaan, Conn.) Scored two goals and added a helper in a 4-1 win on Sunday in Game 3 of the Terriers' quarterfinal road series at #4 UMass Lowell. He also dished out an assist in Saturday's Game 2 setback. Jacob Pritchard, UMass (Sr., F; Macomb, Mich.) Had a six-point weekend to help UMass sweep New Hampshire in the Hockey East Quarterfinals for the team's first trip to the league semifinals since 2007. Pritchard logged a goal and two assists in Friday's 5-4 come-frombehind victory in double overtime and repeated the performance in Saturday's 6-0 shutout over the Wildcats. Both performances matched his career single-game high for points. Bobby Trivigno, UMass (Fr., F; Setauket, N.Y.) Contributed five points on three goals and two assists and was a plus-five in UMass' Hockey East Quarterfinal sweep of New Hampshire to help the team advance to the TD Garden for the first time since 2007 and fourth time in program history. The rookie sparked the Minutemen's comeback in Game 1, down 3-0 in the second period, by opening the scoring for UMass in the final minute of the period and setting up the next goal just 1:08 into the second period to make it a one-goal game. In Game 2's 6-0 shutout, Trivigno had a goal and an assist, his seventh multi-point game of the season. Ryan Dmowski, UML (Sr., F: East Lyme, Conn.) Notched three point (2g, 1a) in a 6-4 win over BU in Game 2 of the Hockey East Tournament quarterfinals on Saturday. He had 13 shots on net in the three-game series. Jordan Harris, NU (Fr., D; Haverhill, Mass.) Led the nation with 10 blocked shots this weekend in a Hockey East quarterfinal sweep of Maine to send Northeastern into the conference semifinals for the third time in the last four years.